"Is Faith always a belief in a Supreme Being?" My blog on Types of Knowledge vs Emotion and Ratio (2) triggered that question. To some extent, my 2016 blog on Faith answers this question. Nevertheless, it feels appropriate to re-address this issue as the concept of Faith (my blogs) plays a vital role in my topics. I have drawn up a new diagram to illustrate my words below. There is a universal philosophical view that the forces of nature and/or the Universe are either Good or Evil. The Sumerian religious beliefs of some 5,000 BC already document this view (my blogs on Sumer). The subsequent religious beliefs of Zoroastrianism (my blogs) reiterated these views. The main 3 Abrahamic religions (Judaism, Christianity and Islam) still use these ancient concepts. The soul (my blogs) is the connection between the divine and the earthly component in humans. Our Faith is an incoming energy source. 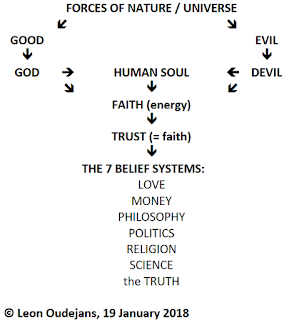 Trust - or faith - is an outgoing energy source, directed to my concept of the 7 Belief systems. To clarify - or confuse - things: Faith (with a capital letter F) is what many people often call religious beliefs - or even Religion. Trust is what many people call faith (without a capital letter F). 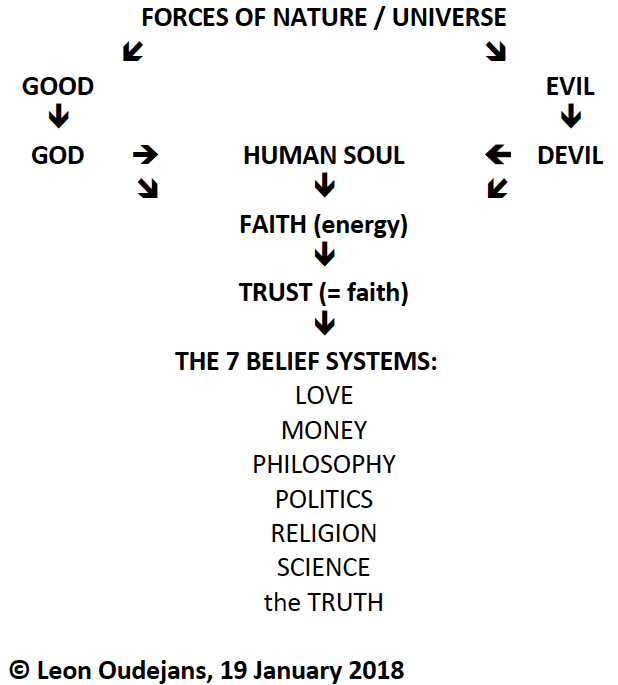 However, Religion is a human - or man-made - codification of religious beliefs, while serving human purposes in the Power dimension of the 7 Belief systems. 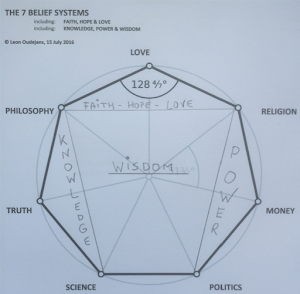 Excerpt from my 2016 blog: "I think, feel and believe that Faith is something like a connection between dimensions, similar to a WiFi signal. The connection isn't always stable and its strength varies constantly. We cannot hear, see, smell or taste its signal. It is beyond human senses. Still it's there. Getting closer to the WiFi router (ie, the source), usually gives a better connection." I still stand by that 2016 conclusion and I would not be able to improve its wording. We often refer to that connection between dimensions (eg, SpaceTime) as a (religious) belief in a Supreme Being (eg, Allah, God or Yahweh). Mahatma Gandhi once stated: "God has no religion." I would add: Allah, God or Yahweh wants our faith and gives Faith in return.